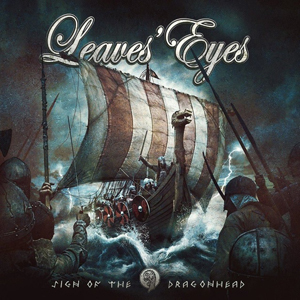 Checkout the cover artwork, track listing for the upcoming LEAVES' EYES album Sign Of The Dragonhead! The hearts of symphonic metal fans will beat faster: Epic metal hymns, cracking rock songs, great choirs, powerful classical music, a top notch production and magic melodies - on top of it all Elina's outstanding voice. The energy of the latest shows and tours (a.o. with SABATON in North America) were taken directly into the music and studio recordings! The biggest LEAVES' EYES record to date. The London Voices choirs of Lord Of The Rings and Star Wars are back again, as well as the classical ensemble of Victor Smolski from Belarus and various folk, classical and percussion musicians. Once more LEAVES' EYES take the listener into the world of Norse Mythology and Viking Sagas. The dragon ship sets sail to new horizons! Full speed ahead! AFM Records Pre-order link HERE. "RULERS OF WIND AND WAVES"
Street date: January 12th 2018 via AFM Records!